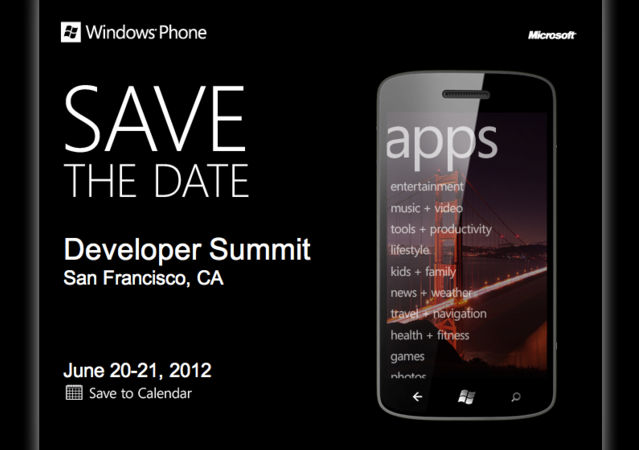 Microsoft has announced a Windows Phone Developer Summit that will take place from June 20th to the 21st next month. The summit will be held in San Francisco, California and, according to sources, Microsoft is using this event to attract developers and big name brands to the Windows Phone platform. Unfortunately, for the Windows Phone platform, although it is very different in a good way, many stubborn adopters are quick to complain that not all applications are available on it from other platforms. In a way, this will always be the case among different mobile platforms, it’s part of the competition. At the same time, Microsoft has done a great job over the past couple of years to bring some other-platform titles to the Windows Phone, even as great Xbox LIVE titles. With this developer summit, Microsoft is expected to publicly introduce to big name brands coming to Windows Phone, call out big name brands to work on the Windows Phone and promise their time will be worth it, or both. I don’t know what the summit is, but Microsoft needs to have some sort of conference where the big app names developers will congregate and port their apps to windows phone. Standing by would be Microsoft engineers helping them. Of course incentives would be presented for participating developers.